One of my favorite foods, is mash. Super-easy to make! 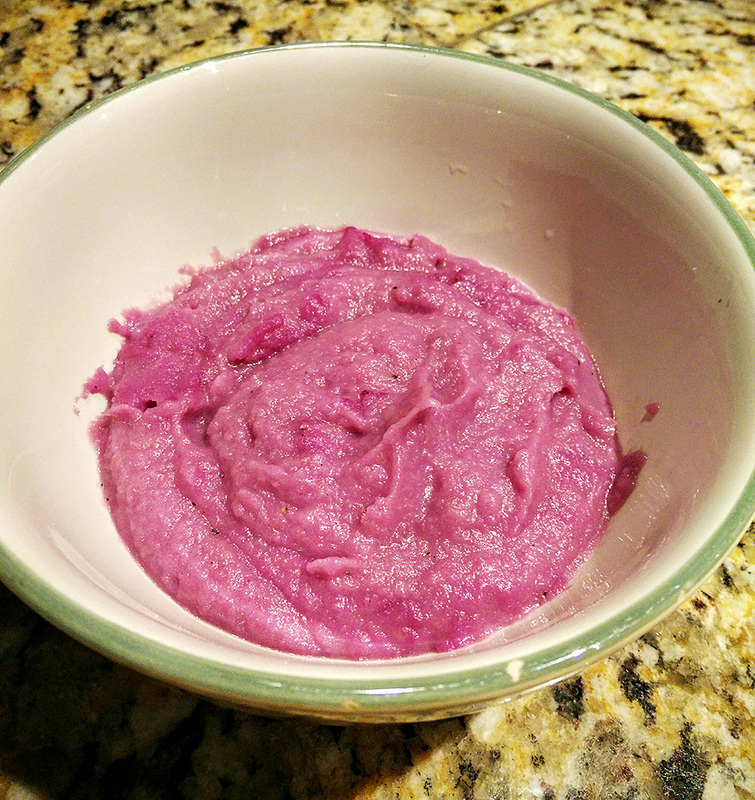 I made a batch tonight, using 2 turnips, 1 rutabaga, and just half of a purple yam. It turned everything a beautiful purple color. I kept some for tomorrow, and I froze the rest. 1. Peel, wash, and cut the roots in cubes. 2. Boil in water for about 20 minutes under medium to high heat. 3. Drain, and place in a large bowl. Add the butter, kefir, salt & pepper. 4. Using an immersion mixer, mix everything well. 5. Serve immediately, refrigerate up to 2 days, or freeze in plastic boxes. 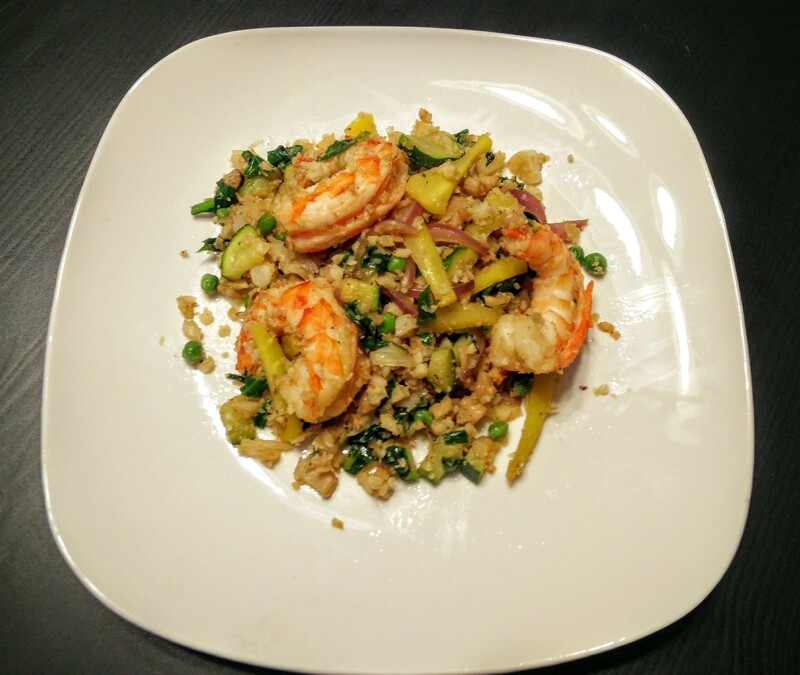 Cauliflower fried rice is the best substitute for Chinese fried rice on low carb and grain-free Paleo diets. Here’s a generic recipe for it, but accompanied with hints and tips on how to make the recipe work best. 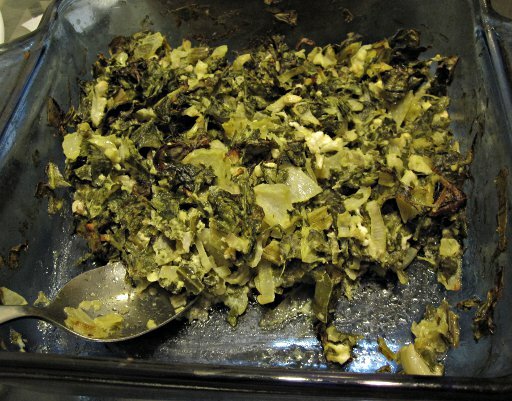 You see, if you treat cauliflower like rice, you will end up with a mushy, cabbage-smelling dish. Following the tips below, will bring your fried cauliflower much closer to the real thing. 1. On a small frying pan, with a tablespoon of olive oil, crack an egg on low heat. Using a wooden spoon, swirl continuously the egg, until you achieve a scrambled egg consistency. Turn off the heat before the egg is fully cooked, set aside. 2. On a wok or frying pan, add the shrimp (or mushrooms), 1.5 tablespoons of olive oil, peas, veggies, leeks, garlic, and black pepper. Stir occasionally. Add the soy sauce. Cook in medium heat until the shrimp is done and the leeks have become transparent and soft, and there’s no liquid left in the pan. Set aside. 3. Using a food processor and its S blade, add half of the cauliflower in it. Give it 5-6 jolts until the cauliflower has become “riced”. Do not make the pieces too small, but it should still feel a bit chunky. Set aside, and process the rest of the cauliflower. 4. On a very large frying pan (I used a 14″) that is not wok-like (but rather it has a flat surface), add 1.5 tablespoons of olive oil, the turmeric (if using), and the cauliflower. Under high heat, fry the cauliflower, stirring occasionally, until it starts to get burned marks and it starts to feel dry. 5. Add the meat mixture in to the big frying pan with the cauliflower rice, and stir. Add the scrambled eggs, green onion, and stir. A minute later, turn off the heat, and serve. 1. We use a very large, leveled frying pan instead of a wok because woks tend to trap moist. We’re trying to get rid of as much moist from the dish, because it’s that moist that brings the cabbage smell to cauliflower. 2. 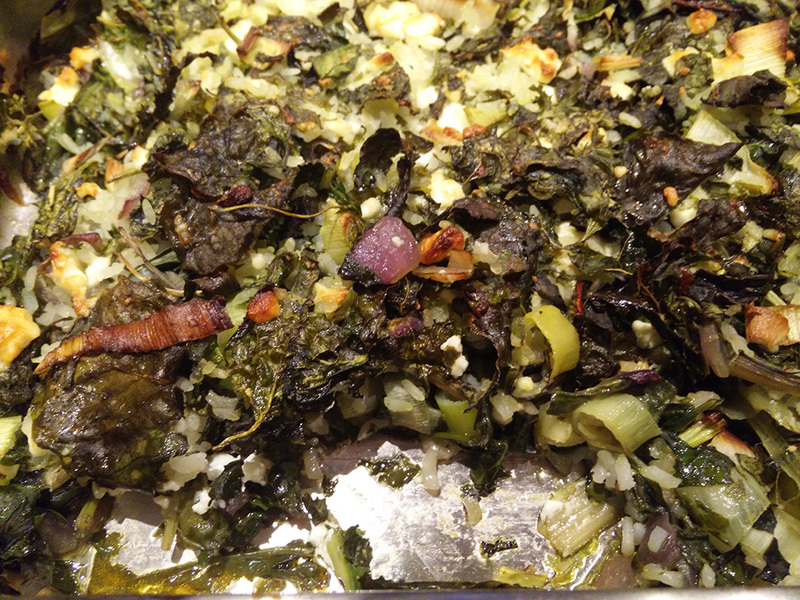 We’re using leeks because these emulate the sweetness of rice. Without it, the dish comes out a bit flat in taste. 3. Do not process the cauliflower too much, or too much moist will come out of them. 4. Do not crack the egg on the same pan as the cauliflower. While scrambling the egg on the side of the pan works with rice, it doesn’t work as well for cauliflower. Same goes for the meat mixture. Yummy breakfast! Please soak these nuts & seeds before using! Variation: You can also use a teaspoon of unsweetened cocoa powder! Optionally, a pinch of cinnamon too. 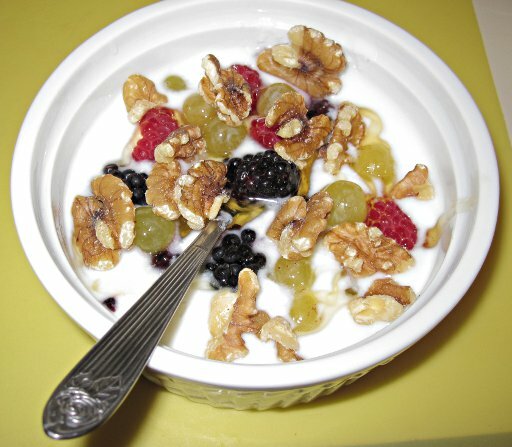 Or, you can use a chopped banana instead of berries! These breakfast muffins were the original craze in the Paleo community back in 2012. The idea is that you can make them ahead of time, refrigerate them, and then you microwave some of them for a few seconds in the morning, for breakfast. 1. In a big bowl whisk well the eggs, with the optional grated cheese or coconut milk. Then sprinkle salt & pepper to your taste. 2. Cut the green onions, mushrooms and vegetables in small pieces. Preheat oven at 350 F (180 C). 3. Place the chopped vegetable ingredients in a frying pan and fry in medium heat for 3-4 minutes with some avocado oil, while stirring often. If you’re frying potatoes/yams, cook them first for a while, before adding the other veggies. 4. Using a large spoon, pour the fried ingredients in the cupcake/muffin pan holders, using equal amounts for each. Then, using a ladle, pour the egg mixture on top of each the muffin holder. 5. Bake for ~20 minutes, or until golden brown. Remove from the holders immediately and let cool. Then refrigerate for up to 3-4 days, and if wished, each morning microwave for 15 to 30 secs (depending on the microwave unit) the quantity you need for breakfast.